I am happy to greet you all, who have gathered here from all over the world. In this momentous session we have to explore and find out ways and means to cement and strengthen the solidarity of mankind. Nations, like individuals, are swayed by passions, prides and prejudices which create chasms in the real social order which are very often difficult to span. We are living in an age of decadence, when moral and spiritual values are at their lowest ebb. With all these drawbacks and the numerous divisive tendencies, there is still a ray of hope of regeneration and reorientation. This very hope has brought us together. I thank you all for the loving response to the call for remodelling of our destiny to secure a lasting peace. It is said that “East is East and West is West and never the twain shall meet.” That may have been true at one time or another, or for the author of the dictum, Rudyard Kipling; but certainly it carries no weight with men of God in the present scientific age, when distance and space are fast losing their significance, and efforts are being made to establish interplanetary contacts. The various countries of the world are just like chambers in the house of God, housing different nations. Distinguished from one another by geographic, climatic and historical conditions, facial contours and complexions, languages and dialects, diet and apparel and modes of worship, all people conditioned by these divergent factors form the great organic whole called humanity. With all these seeming differences and distinctions of colour, creed, and caste, and these diversities in his modes of living and thinking, man essentially and basically remains man in outer appearance and inner make-up. Unity already exists in the human form, since each one is born the same way with the same outer and inner construction, and each one has a soul which is of the same essence as that of God. We are drops of the ocean of all consciousness, whom we worship as the same God, calling Him by different names. Holy men say that the human body is the true temple of God, and that He resides in the temple made by Him in the womb of the mother, and not in temples made by human hands, and that the human form provides us with a golden opportunity to realize Him. Man has three aspects: physical body, intellect, and a conscious entity. He has progressed physically, intellectually and mechanically; but despite this, he is unhappy and has not developed spiritually. He has developed his head and not his heart, and his scientific knowledge is misdirected to fiendish malevolence. It has created a spiritual vacuum. The problem before us is how to bring about a change in man’s heart and effect his inner conversion so that he can see truly and clearly and learn to discriminate between truth and untruth. Since this lies beyond the scope of body and intellect, it can only come about through an inward illumination of divine wisdom in the sanctuary of the soul. This is the individual aspect of the matter. We also have to forge abiding bonds of kinship among the nations of the world so they will treat each other with genuine courtesy based on inward love and friendliness, and seek the welfare of all members of the human family, transcending their political ideologies which create rivalries and international tensions. To remain in any “ism” is a blessing, if we keep in mind the ideal for which we have joined it and rise into universalism; but if we stick obdurately to the “ism,” the result is again narrow-mindedness and selfishness. Similarly, if kings nourish their gardens well and keep them blooming in all respects, they should let all other countries bloom the same way and further the cause of human happiness; otherwise there will be conflicts and wars. It has been our endeavour of late to find a common forum and meeting ground where such momentous issues could be discussed dispassionately – by separating the non-essentials from essentials and eliminating differences, in order to find unity in diverse thinking and bring abiding peace on earth; complete concord and amity in all spheres of our life. Thus the way was paved for the next great step, the spread of spirituality or mysticism – the bedrock of every religion. In its pure essence, this implies the awakening of man to a consciousness at once supra-sensible and supra-mental – an immediate revelation. All mystics, Eastern and Western, have believed in the possibility of direct communion with the spirit and power of God through love and contemplation, without the aid of reason and logic. It puts man on the road to inwardness (not to be confused with escapism), with an active living morality as the essential prerequisite. This is the religion of spirit, or the science of the soul, and through it an individual finds his proper relation to the universe by establishing contact with God through His expression, the power called Naam, Shabd, Kalma or Word, which is the maker, permeating and controlling all creation. The relationship with this power is achieved by developing reverence for life at all levels of existence without distinguishing between high and humble – including man, bird, beast, and the lower species. The non-human forms are the younger members of the family of God. This idea of the sanctity of life is a living religion of love in the innermost part of our being. True theism cannot be reasoned out intellectually or felt on the level of emotions; it proceeds from true knowledge, which is an action of the soul in perfect harmony beyond the senses. This is what is called “spirituality”—the contact of the soul with the Oversoul – and it is achieved by rising above body consciousness through practical self-analysis, a demonstration of which can be given by an adept in the process. We call it Para Vidya (the knowledge of the beyond) because it lies beyond our sensory perceptions. This science of the soul is not something new; it is the most ancient teaching of all. The way back to God is of God’s own make and stands on its own, without the necessity of scriptural support to uphold its authenticity. But unmistakable references in the scriptures of all religions from the earliest times to the present day bear witness to the unmanifest reality in its primordial form of Light and Sound. In the present age, Saints like Kabir and Guru Nanak revived the ancient teachings of the sages of the past. In more recent times the torch was kept alive by their successors until the spiritual mantle came to hallow the personality of Baba Sawan Singh Ji, who during his long ministry of 45 years (1903-1948) gave it the widest distribution possible. In 1911 he began the work of revealing the Gospel of Love, Light and Life to the Western world as well. Ruhani Satsang was founded in 1948 and dedicated to the task of imparting purely spiritual instruction, shorn of all ritual and ceremony and free from embellishment and symbol, to all classes of humanity. Followers of different faiths, beliefs, and creeds meet at Sawan Ashram – which became its permanent centre in 1951 – and address large masses of people coming from different walks of life, who are eager to learn and understand the elemental truths which form the quintessence of all sacred scriptures. The discourses converge on the common theme of establishing direct touch with reality, and attempts are made to reproduce and correlate, in simple understandable language, the sayings of sages and seers of all times. Presently this is being spread in 209 centres all over the world which have helped considerably to remove to some extent artificial barriers of race, language, and religion, and brought many kinds of human beings to worship the nameless being with so many names. By the grace of God, a new field unexpectedly opened up in 1957 when Muni Sushil Kumar Ji sponsored a conference of World Religions with the idea of forming a World Fellowship of Religions. As a result of further deliberations there did come into being a fellowship including most of the faiths of the world, and I was elected its President. 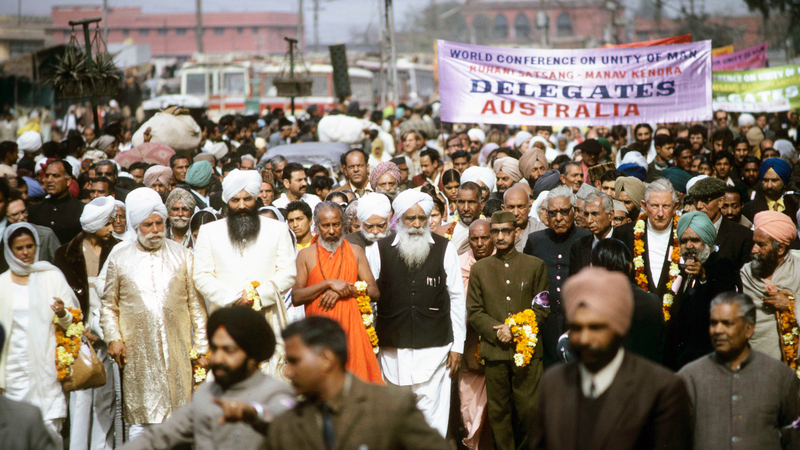 Three World Tours were undertaken and four World Religions Conferences were organized in India, besides regional conferences in other countries. The purpose was to disseminate the idea of universal fellowship among people professing different faiths and beliefs, and it brought about broader and better understanding and a sense of mutual trust and confidence at the top level among the representatives of the various religions. But while the religious leaders were coming closer, a danger was developing among the followers. Instead of making religion a cementing force, they made it an instrument to serve their vested interests and began to form communal groupings bearing the labels associated with their “isms” – fortifying them with artificial walls of hatred and distrust. One wonders how a person professing religion, which is a link between man and God, can run the risk of forgetting that he is a man born with the same privileges from God as those he hates, and that he is a conscious entity which is a drop of the ocean of all consciousness. To combat this danger of religious chauvinism, it was thought necessary to start the work of regeneration from the roots. Man-making must take precedence. This can only be done by inculcating in people generally the humanistic ideals of unselfish love and selfless service, with special emphasis on man service, land service and animal service (animals being our younger brothers and sisters in the family of God). This idea took concrete shape in 1969 with the decision to set up man-making centres or Manav Kendras here in India and abroad. In India a man-centre has been started at Dehra Dun at the foot of the Shivalik Range of the Himalayas. It has set up a hospital, a home for indigent elderly people, and a school for the children of poor families in the area. A provision for farming and cattle-raising on modern scientific lines is a part of the project. Eventually we hope to see a university, fully equipped with the original scriptural texts of the religions of the world, so that comparative studies of the truths contained therein may be undertaken; and a language school to overcome linguistic difficulties. This convention aims to unite all mankind on the common ground of service to fellow human beings and faith in divine power, and to accomplish that, it urges the religious and ethical leadership of the world to shed apathy and aloofness and assume a more prominent role in human affairs. Such conferences in the past have been organized at the level of religions, and consequently have not been able to achieve integration in the required measure. A significant feature of this conference is that it is being organized at the level of man, as envisioned by saints and prophets like Socrates, Buddha, Mohammed, Christ, Kabir, and Nanak, so that it may lead to true integration. The challenging task before the religious and spiritual leaders is to bring about a radical change in the ethical, educational and economic status of humanity. Economic uplift is essential because “a hungry man is an angry man” and to talk of God to him is a mockery. I am confident that each one of us fully realizes the significance of this cosmopolitan meeting and will extend his whole-hearted support toward the fulfillment of its objectives: developing human understanding and heralding the unity of mankind. Let us pledge ourselves to this task, transcending all narrow allegiances and commitments, and stand united and resolute until its ultimate fulfillment.